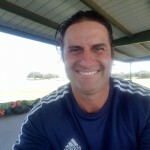 My vision is to inspire creativity, instill confidence and connect with anyone who loves the beautiful game of soccer!! I want to do everything I can to help athletes become their very best! I LOVE THE GAME. Growing up I played all sports but settled on only soccer as a full-time passion when I was about 12 and have never stopped playing and training. I have applied that passion through the years helping players of all ages better their skill, fitness, knowledge of the game, and mental readiness. I am always pushing myself to become a better athlete as well as coach so that I can represent my teachings on and off the field.